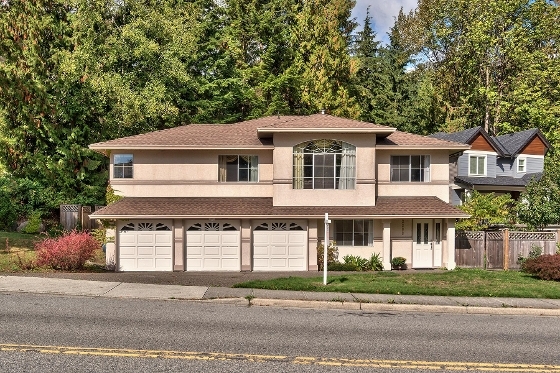 Perfect family home in desirable Hockaday area of Coquitlam. Well maintained, huge 3 car-garage, level lot, 1 bed suite and more. Shows well. This 6bed/3bath/2lvl/2691sqft home sits on a level 6000sqft fenced lot backing onto a lush forest backdrop. The bright main level features expansive windows, laminate floors, spacious living & dining rooms, large kitchen w/SS apps & eating area & BBQ sized deck. The large master w/walkin & ensuite, 3 well sized rooms & 4pc bath complete this level. Above-ground lower level:1 bed for main living, laundry area, garage access & bright, 1 bed suite w/separate ent. Bonus: freshly painted throughout main home, newer blinds, 5yr young roof & 1yr young fence. Act Now!